You may like reading, or you may have to read some materials for a certain goal. Internet is a quiet good resource. So you surf the Internet, and download related information. The information may be a WORD document or in the form of PDF. But anyhow, you may prefer the WORD form, since you have been used to it or for another important reason—When the document is in the form of WORD, reading it can be good for your eyes. You just need to adjust the the value of “Hue, Sat, Lum” to “85, 90, 205” respectively and the background color of WORD will be light green which will protect your eyesight. But how, how can you make the change happen? Or how can you convert PDF to WORD? Now I’d like to tell you that there is a tool for your help. And this tool is VeryPDF PDF to Word Converter. It is developed by the VeryPDF group who concentrate on developing software to help you use your computer more flexibly. And it is not limited to convert texts, but also forms and images. The layout of the target document will be well preserved. You can try to use it. And then if it satisfies you, you are encouraged to buy it for your long-term use. Now let me show you how to use it. First, download VeryPDF PDF to Word Converter and install it on your computer. You may create a Desktop Visualizer to open it more conveniently. Now you can choose accordingly. For example, you can choose the “Page Range”. You can choose “All” or “1 to 10”. Once you are sure of your choice, click “OK”. And you’ll see the WORD form on your desktop. 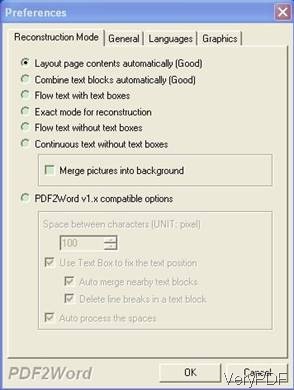 Finally, I’d like to remind you that please do not forget the downloading site of the tool which help you to convert PDF to WORD. 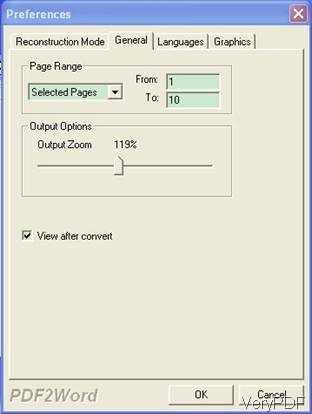 It is called and it is in the website of VeryPDF PDF to Word Converter. You can download it from our website then you can use it free.